Ancestral Quest has many research tools built into the program to aid you in continuing your research. 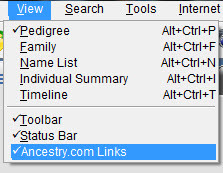 One of them is shown above and is only seen by putting your family file in the "Pedigree" mode and then turning on the "Ancestry.com" links located on "View". Once the above is checked those links come into view. From this point highlight the individual you are researching and click on either ""trees" or "recs". When you click on "Trees" you are taken to RootsWeb World Connect Project and shown what matches the search on that individual. This site is managed by Ancestry.com and is one of the oldest websites of individual trees, it is a free and active website. When you click on "Recs" you are taking to records in Ancestry.com. This results combined with the above is a great start to one's research within Ancestral Quest!